Walking down the aisle in a statement-making, floor-grazing wedding gown that is buzz-worthy is the dream of every girl. But sometimes it goes beyond the dress — from having the most fabulous wedding venue, ethereal wedding reception decor to even the most beautiful cake that guarantees an Ex a sleepless night. Yesterday was no different when the daughter of Chief Gabriel Osawaru Igbinedion (the Esama of Benin Kingdom) kept this in mind as she tied the knot with her man, Samuel Ganiu Kuteyi. 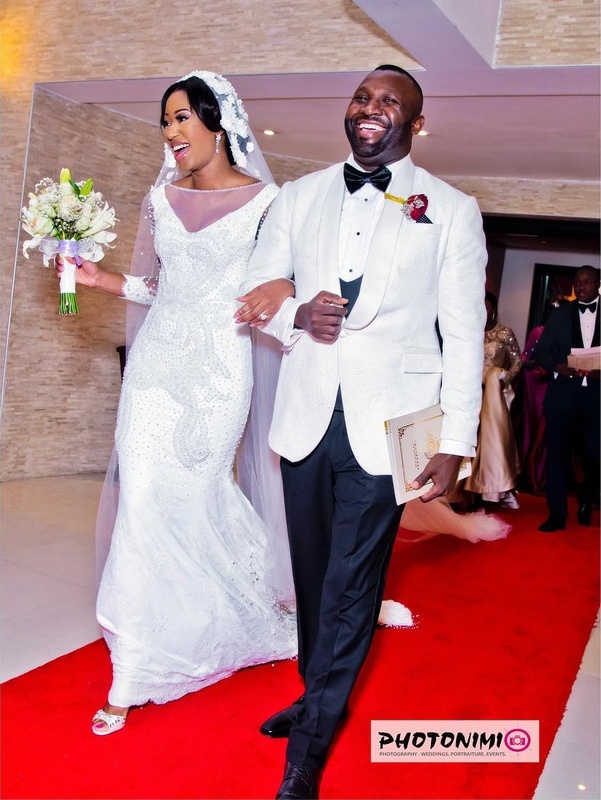 Since it was her big day, the bride chose her embellished gown from a renowned South-African designer, Gerf-Johan Coetzee paired with a matching Dolce & Gabbana shoes. The gorgeous dress with sheer plunging neckline also featured sheer long sleeves decorated with stone beading and a floor-grazing train. It was a smart and fashionable choice, to say the least. But looking at her wedding cake, it looked like the bride intended to feed her guests with it. Just at first glance, you’ll be convinced guests were struck by just how tall, beautiful and opulent this confection was. And the most beautiful part? She matched her look with it. keep clicking to see her gorgeous gown, her bridesmaids, the father dancing with her and the skyscraper cake. The bride with her man.